Contest One Grand Prize Package Includes $500, Publication, and Subscriptions to premium resources for writers. We're excited that this quarterly writing contest provides another opportunity to foster and encourage emerging writers. 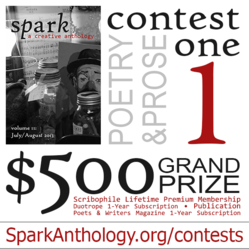 "Spark: A Creative Anthology," the quarterly publication from the Empire & Great Jones Creative Arts Foundation, has launched a quarterly writing contest open to all writers and genres, with a Grand Prize package which includes cash, publication, copies of the anthology, and subscriptions to Poets & Writers Magazine, Duotrope, and Scribophile. Learn more and enter Contest One at http://SparkAnthology.org/Contests/One. The writing prompt for this contest is the single word spark. The word is not required to appear within the text of a contest entry, but entrants will need to include a 90-word-or-less description on the entry form explaining how the word spark inspired or influenced the work. There are no genre restrictions for this contest, and content guidelines are similar to our standard submission guidelines, including what we are not accepting. Contest One awards prizes for poetry and prose. This contest runs from January 1 to March 1, 2013, and winners will be announced April 2, 2013. This contest is not endorsed, sponsored by, or affiliated with Duotrope. This prize was selected by "Spark" as a tool we admire and feel would be useful to contest winners, as it has been to us. The one-year subscription to Poets & Writers Magazine was donated by Poets & Writers. The Lifetime and one-year Scribophile Premium Memberships were donated by Scribophile.